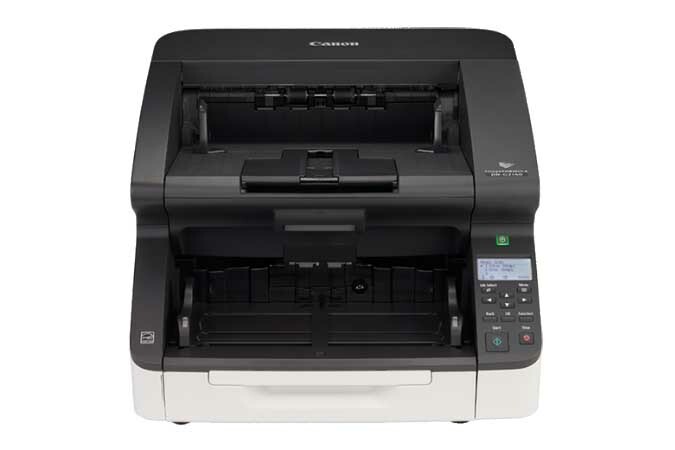 The Canon imageFORMULA DR-G2140 production document scanner, with both USB and ethernet connectivity, provides businesses with a high-performance, reliable, and flexible scanning solution as part of a robust document management system. The DR-G2140 scanner is ideal for processing large amounts of documents in mission-critical, centralized production scanning environments. The DR-G2140 scanner handles up to 140 pages per minute—both sides in a single pass*—and holds up to 500 sheets in the ADF. Equipped with a dedicated, onboard image processing chip, making it capable of maintaining fast scanning speeds, independent of PC performance. This scanner is flexible enough to reliably handle a variety of document types, from business cards to ledger-sized documents, long documents, and thin or thick documents, using its advanced feeding mechanism. The DR-G2140 scanner features an intuitive control panel that allows easy access to scanner settings, and user-programmable job buttons for one-touch operation.